It has been an exciting week and yesterday I had fun playing with little bits of fabric to make maple leaves for my table runner. I’m auditioning some layouts and then put the runner together. Quilting the autumn table runner is going to be a challenge as I want to use the maple leaf as a quilting motif but I don’t want to mark on the fabric with any marking tools. I do have a plan…. read on and see what these 4 helpful tips for auditioning block layouts are. 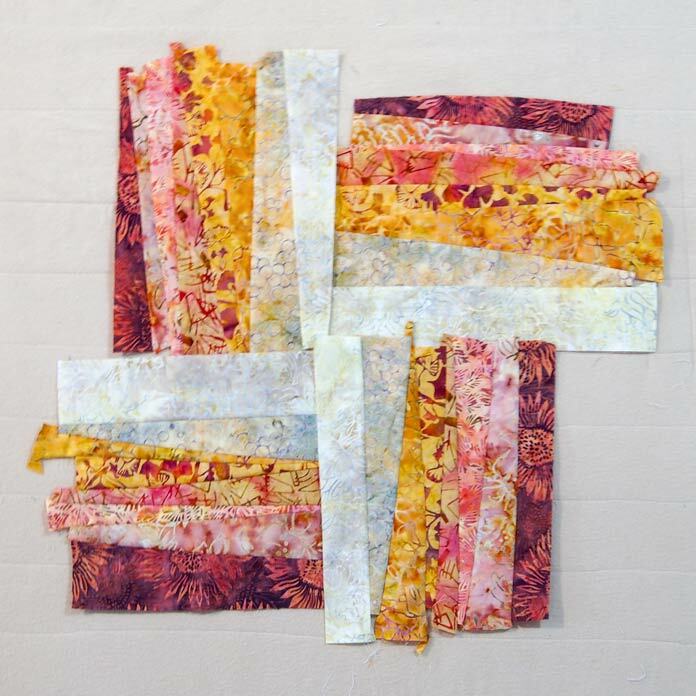 Many quilters struggle with designing their own quilt and how to layout the blocks in a pleasing and eye-catching design. I too often struggle and debate many times over layouts before I finally make my final decision. The funny thing is that it’s often my first layout that is my final choice. It’s a process. and one must go through the process to be fully satisfied with one’s decision. My first thought was that the piece would be a wonky shape like the blocks. I did like the layout of the blocks using wedges. I just wasn’t sure I wanted to do all the math to add the extra background fabric in to create the piece. Plus I found that the leaves sort of got lost in the fabrics and didn’t stand out. Doing all that work yesterday to make the leaves I definitely want them to stand out. My second thought was just to put them together in a square. They form a pinwheel of sorts in the center with this layout. But the problem still lies in where to put the leaves so they stand out. Notice I haven’t squared off the blocks yet. I don’t want to do this until I decide what I’m going to do. The third thought was to make a standard rectangle table runner. Next question is how to position the blocks. I’ve placed the blocks in a row alternating where the dark and light are. This gives the sense of movement in the design and a nice flow to the colors. I have now squared off the blocks so I can get a better sense of how they’ll look in a row and how they’ll flow. TIP 1 A design wall is very helpful for auditioning layout options and seeing what works and what doesn’t. In order to really see something and how the parts make a whole one needs to stand back from it a good 10 feet. This allows you to see how the blocks meld together or not and whether the colors work. I’m finding that it’s still a bit plain and needs something else. I added a border on the top and bottom of the lightest fabric and placed the leaves in the light sections of the blocks where they spill over into the border. TIP 2 If you don’t have the luxury of a design wall then taking a picture and looking at it on the camera will do the same thing. Or placing the pieces on the floor and using a reducing glass to look at them – the reducing glass gives the illusion of distance. This looks pretty good but what about if I add some of the darkest fabric into the borders. TIP 3 If you have the luxury to cut the pieces of fabric the right size it will allow for a better representation of the final product as opposed to folding the fabric and pinning a lump in place. The dark fabric in 4 spots makes the layout below look heavy. How about in just 2 spots. It looks better but I find that my eye is drawn to the dark fabric rather than the rolling hills of the inner foundation pieced section and the maple leaves. TIP 4 Let it sit on the design wall for a period of time. Keep coming back to look at it in the day’s different lights and see what it looks like. Even think on it overnight – who knows you might have an epiphany in your sleep or you might just say yep this looks good and move onto the next phase. And if you’re not adverse to criticism you can always ask your partner or a friend for their opinion. I usually do this when I’m sitting on the fence about the layout design. I’ve made my decision and I’m going with the light colored border. Now it’s time to piece the quilt together and do some quilting. 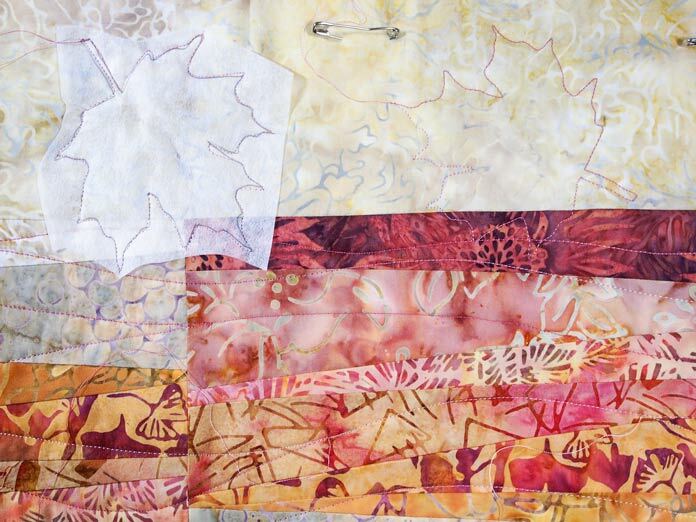 I’m quilting the center section with Sulky Rayon thread – simple undulating lines to mimic the rolling countryside. 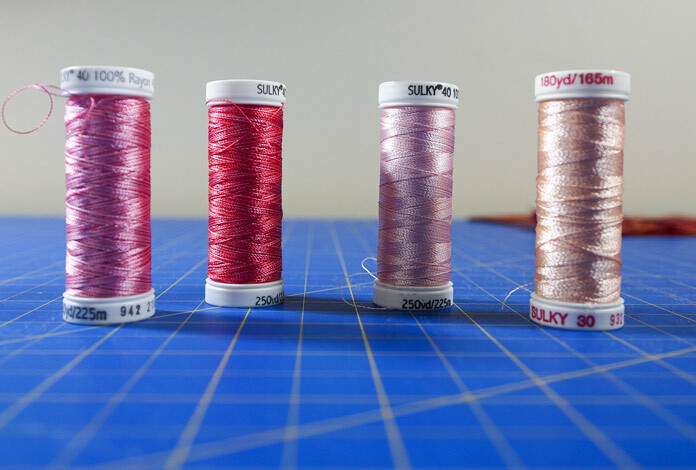 Did you know Sulky Rayon thread is made from a regenerated fiber which is stronger than both silk and cotton? It has the smoothness and luster of silk. This thread comes in both 30 and 40 weights. The 40 weight is perfect for free motion machine embroidery and other decorative applications. It can be used in the bobbin. The 30 weight thread is perfect for top-stitching, quilting and decorative satin stitches. I love how this thread shines and stands out on the quilt, whether it’s the quilting on the background or edge stitching on applique. It comes in a multitude of solid and variegated colors – in fact 388 in the 40 weight and 156 in the 30 weight. I don’t think I’ll ever be at a loss for the right color with this many to choose from. I like to sandwich my quilts and do all the quilting before adding the applique. This allows me to stitch across the whole piece and not have to stop and start when I reach the leaves. It also means the whole piece is quilted and there are no large areas under the applique pieces that are not quilted. Once the middle is quilted I’ll move onto the border. 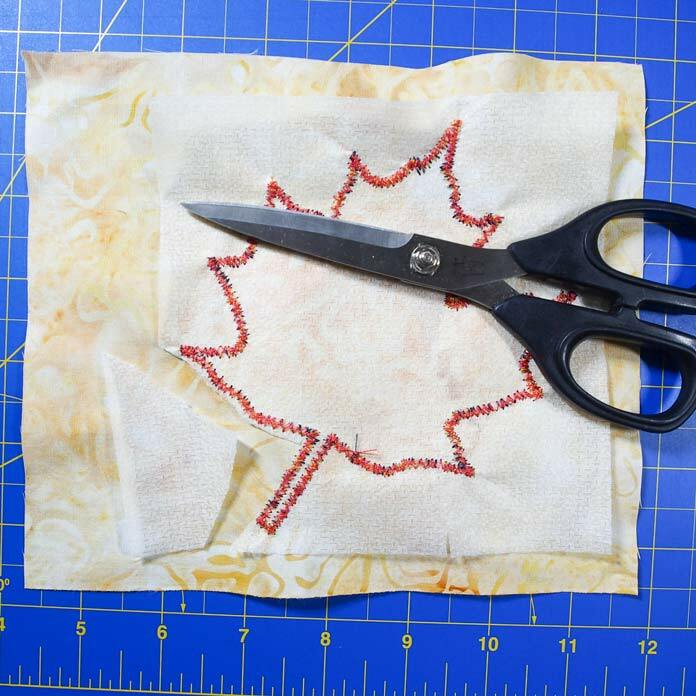 For the border I’m going to use the maple leaf motif, draw it on a tear-away stabilizer, pin to the quilt, stitch the motif and then tear away the stabilizer leaving lovely stitched leaves in the border. If I had decided to stitch the applique pieces prior to sandwiching the piece then I would need to stabilize the fabric in order for the stitches to have something to stitch into. Just the fabric is too flimsy for nice even, stable and smooth stitching. I’ve made a little example of a leaf and background as an example. I chose the Soft ‘n Sheer Extra cut-away stabilizer for this job because it’s fusible and no pins would be required. After fusing my applique piece to the right side of the background fabric, I fused the stabilizer to the back of the fabric making sure that it covered the whole applique design. After stitching the leaf shape in place the extra stabilizer can be removed. 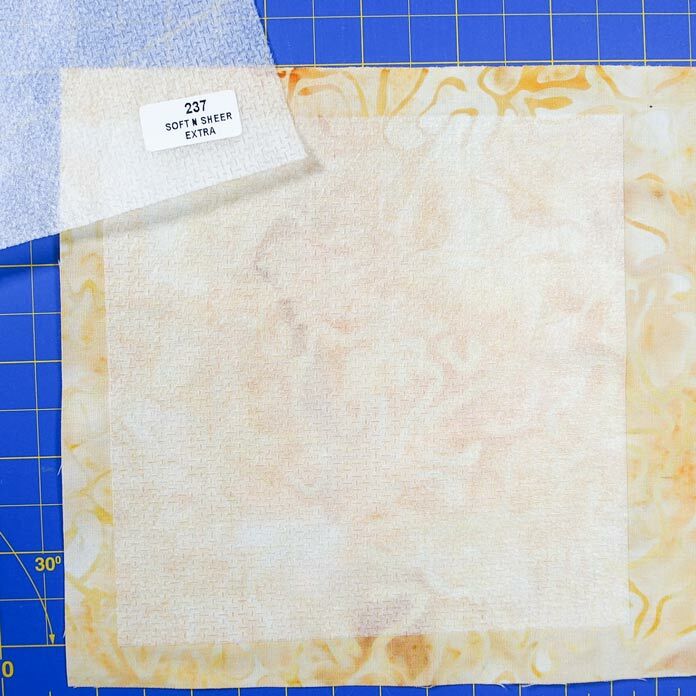 The Soft ‘n Sheer Extra peels away from the fabric easily and with a sharp pair of scissors it can be cut away as close to the stitching as possible. The stabilizer inside the shape can be left in place. It has a soft fabric like texture so no one will ever know it’s there. All that’s left to do is to stitch around the applique and add a binding. The stitching around the leaves will be in the darker pink Sulky Rayon thread and the binding will be the same fabric as the border. Once it’s done I can display it on my table for all to see and admire. 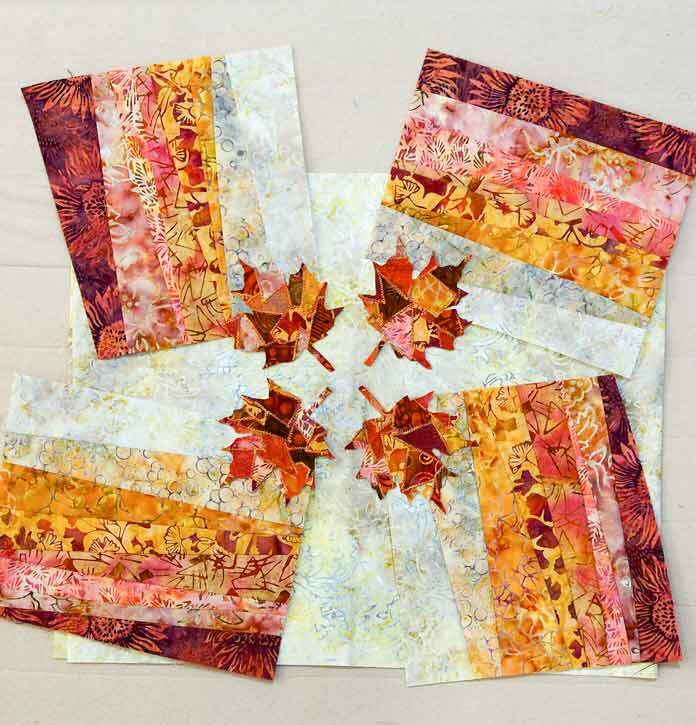 I’ll leave you now enjoying this colorful autumn season while pondering the 4 helpful tips when auditioning block layouts and the next project you’ll apply them to. I struggle with layouts so thank you for posting these tips. They are very helpful. These tips really are helpful! I often struggle with the layout of blocks that I’m playing with and find that taking pictures with my phone really help. Once I get 5 or 6 (or more) photos of the various layouts, I can eliminate the ones I don’t like and narrow it down to a favorite. The extra eyes of a friend or hubby help too! Thanks for the extra tip for using stabilizer when appliqueing…I will definitely use that one!